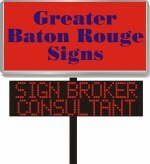 Don’t have the budget for outdoor electronic message boards? How about, ‘I don’t have the ability to use an outdoor board at my location’. Then consider an Indoor LED moving message board! They are the perfect solution for reaching customers. Attention grabbing, eye catching. Make your location the ‘center of attention’. Easy to use and program. When combining text with animation, you create an environment outside your location for ‘drawing’ potential customer’s eyes to your location! These lighted signs are a major breakthrough in the sign industry, because of the intensity and design capability this opens up a whole new impact with the point of purchase sign. Ibrite unit’s use ‘outdoor-bright LEDS so you can use them inside your store or as a ‘window’ display. Please visit: http://www.ibrite.com to see what we can offer and then call us for a consultation at your location.